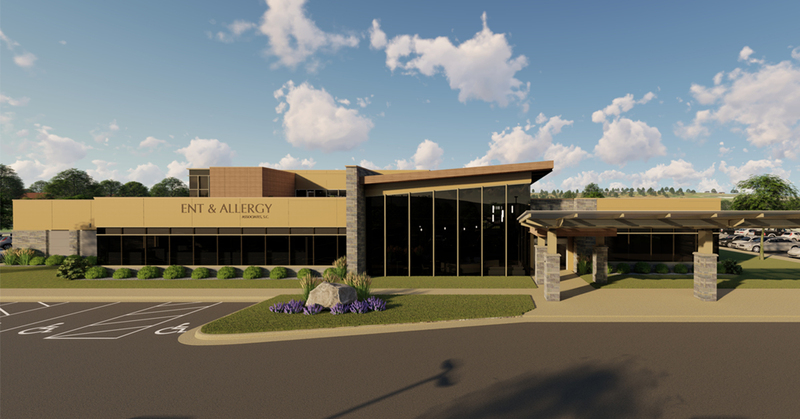 ENT & Allergy Associates is building a new patient-focused clinic to serve the growing need for their specialty care in Wausau and outlying communities. The 32,000 square foot facility takes into account every detail of the patient experience and is designed to support providers and staff in delivering the very best care. Ghidorzi is the architect and general contractor, serving as a single source of accountability for ENT & Associates in the design build construction of their new clinic. The clinic is part of Ghidorzi’s 2800 Stewart Avenue development. 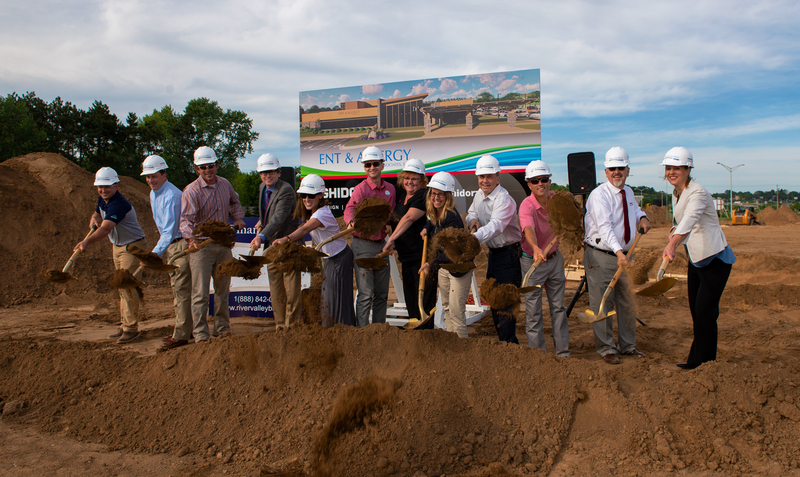 The premiere location at 512 S. 28th Avenue in Wausau provides improved access for patients whether traveling to the clinic locally or from surrounding areas. The new clinic will also bring under one roof the satellite services currently offered at 3200 Westhill Drive in Wausau. The 2.6-acre parcel accommodates plenty of parking and green space. 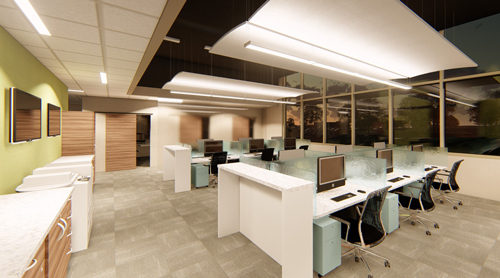 An expanded waiting room featuring multiple seating options with productive workspace for professionals and students. Spacious exam rooms to accommodate family members. Positioning of the Audiology department near the building entrance for our patients’ convenience. Wider hallways to enhance mobility throughout the facility. Layout of exam room technology and supplies to keep providers and staff facing the patient. A floorplan that enables unparalleled collaboration across specialty areas of the clinic to produce greater patient outcomes. Amenities that encourage providers and staff to care for themselves in an effort to better care for patients. Meeting rooms for collaboration among staff balanced with dedicated individual workspaces. Sound absorption to enhance patient privacy and relaxation and staff focus and productivity. Abundant natural daylight for the wellbeing of patients and staff. Electrochromatic glass technology controls brightness without window coverings, creates a connection to the outdoors and reduces energy use and costs. State-of-the-art variable refrigerant flow (VRF) multi-zone heating and cooling system to ensure patient and employee comfort, in addition to energy efficiency. The exterior building design complements the Wausau landscape with natural stone and wood elements. 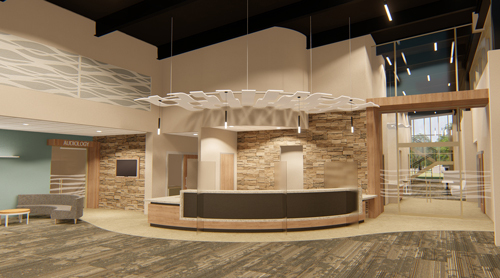 The aesthetic is timeless to reflect the longevity of ENT & Allergy Associates in the community as the clinic approaches its 50th anniversary, with modern accents to represent its progressive specialty care. ENT & Allergy Associates is a physician-owned, independent medical group. Their team looks forward to serving patients for many years to come from their new clinic.